Olimex has announced that they started shipping A13-OLinuXino-WIFI-DEV, an AllWinner A13 development board with 512 MB, 4GB and a Realtek RTL8188CU Wi-Fi module that costs 55.00 Euros with free shipping by courier for a limited time. They announced the start of this project late April, so it took them just 3 months to bring this board to to market. Video output – VGA video output + LCD signals available on connector. This board will ship pre-installed with Android 4.0 image, but preliminary versions of Slackware and Ubuntu are said to run on the board. Please note that this board (Rev. 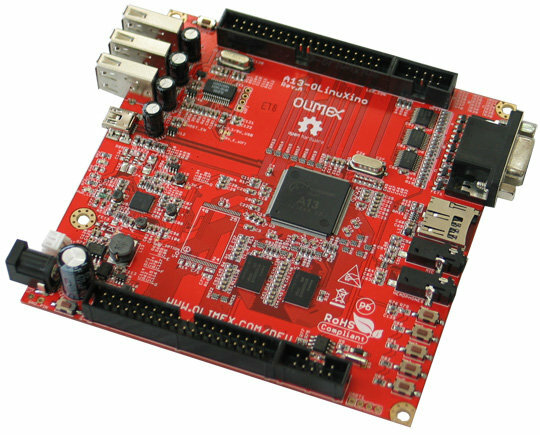 B) is for early developers and a few things still need to be ironed out such as VGA output, proper Linux support etc… Once all major issues are fixed, Olimex will sell an updated board (if hardware changes are needed). Support is available via OLinuXino Yahoo Group and #olimex irc channel. You can get more information and/or purchase the board on A13-OLinuXino page.